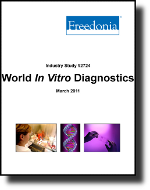 Global demand for in vitro diagnostic (IVD) products will increase 7.1 percent annually through 2015. The US, Western Europe and Japan will remain the dominant markets, while developing world demand grows the fastest. Molecular diagnostics, cellular analysis and pathology products will be the fastest growing technologies. This study analyzes the $43.8 billion world IVD product industry. It presents historical demand data for the years 2000, 2005 and 2010, and forecasts for 2015 and 2020 by product type (e.g., clinical chemistry, immunoassay, diabetes testing, blood testing, molecular diagnostic, pathology, cellular analysis, microbiology), application, world region and for 14 countries. The study also considers market environment factors, details industry structure, evaluates company market share and profiles 25 industry participants, including Roche, Siemens and Abbott Laboratories.